Have you ever opened the door to a closet and wish the clothing inside would magically arrange itself? Keep dreaming friends, as technology has not made it this far (at least yet anyways). For now, we have to rely on our trusty two hands and a little bit of ingenuity. No one said organizing was easy, but the hardest part is getting the motivation to dig in. As well, there a few tips the experts use to make the job go by quicker. A kitchen is the heart of the house. It is a place where you spend most of your time in. Impromptu gatherings or a formal affair, it is the place to hang out in. With the open design it is a place where most of us would like to get the feeling of Zen and completeness. Spring is finally here, which means many people across the country are getting ready to deep clean their homes and tackle a wide variety of home improvement jobs. If you are planning on taking on a remodeling project and are working on a budget (you should always set one), there are many tips that can help you save a ton of money and still complete your work without making any sacrifices. Although the economy is still not in the greatest of shape, that doesn’t mean you should have to put off your dreams. It is important to note that more and more people are engaging in home improvement projects more for the energy-efficiency aspect than for aesthetic purposes. A popular home improvement tip is making sure your home is sealed up nice and tight will have a dramatic effect on that utility bill you receive every month, so this is worth keeping in mind before you decide spending a fortune on additions and renovations. At any rate, regardless of the project you have in store, take the time to read through this list of cost-saving tips to make it worth your time in the long run. Borrow, rent or buy used tools and equipment instead of purchasing brand new ones. Get in touch with friends or family members to see if they can lend you the supplies you need to get your home improvement job done. There is no point in spending money on tools you may not need again for quite some time. While you should have a set of basic hand and power tools handy, some things are better left at the store. Do the home improvement job yourself if possible and take advantage of cheap labor (the same people who loaned you the equipment) instead of hiring a contractor. Unless you are performing a major renovation that requires professional help, you can save a ton of money on labor costs by doing the job solo. Teach yourself how to perform simple tasks; time is money, so adequately prepare yourself for the project by watching online how-to videos and reading through step-by-step guides. This will help you finish the job more quickly and right; there is nothing worse than having to spend extra money to fix mistakes. Consider the weather; if the remodeling project you are going to be performing will expose your home to the elements, make sure to wait until the climate is suitable before beginning. Be willing to negotiate and make sacrifices; many home improvement projects come with surprises; if you come across a costly decision (such as whether to re-locate plumbing lines or install a new load-bearing wall), stick to your initial budget. Pay out of pocket; taking out a loan means paying interest, and this can quickly add up depending on how much you intend to borrow. Saving up in full beforehand could potentially save you hundreds or even thousands of dollars for your next home improvement job. Let go of the old and ring in the new. Finally it’s time to bid adieu to the cold winter, and time to say welcome to the colors of the season. It’s time to welcome spring. It’s time to dwell in the glory of its colors, the sunshine, and life, once again. It’s time to say bye-bye to the old and welcome the new. Well, not literally so! In short it is time to do away with the clutter of the bygone year and ring in the new and fresh stuff. Just that perfect time to clean up the clutter of your home and things that are not needed. Making space or space for new things almost brings it a new lease of life. Look around and see the clutter. Instead of trying to do up the entire space together, take up one area each day. Breaking up the entire area and handling small spaces, makes it easier to handle while also giving a sense of achievement when done. If you see things that have lost value or you do not need it, do not hold on to it. You have options – throw away, donate or recycle it. That should be the simple rule of thumb when trying to declutter your home. Do away with things that you are not anymore attached to emotionally. It could be a bad relationship, things that have gone outdated and bad, or old documents and papers. They help clear up a lot of space. You may have second thoughts of keeping these things. ‘Let go and bring in the new’ is the mantra for spring. Think of the new things that you are planning to get and how would you use it around the house. The new things can simply motivate you to declutter and clean your home up this spring. It is very rightly said, unless you let go of the old, you cannot ring in the new! So, declutter and go for it! Having a small bathroom is not a challenge. What is more challenging is to do it up in a way that brings about a sense of space as well as utilize that which you have to make the most of the small space. Remodeling sparks the thought that hundreds of dollars ought to be spent to spruce up an existing space. Doing up an existing space or for that matter a small bathroom is not really a big expenditure. Small and affordable changes can give it the new look and make it look better than ever before, so check out these remodeling ideas for small bathrooms. A simple and the first and foremost point is to remove unnecessary stuff from your bathroom. If your bathroom is small, it does not make sense to overdo it or keep more than that which is necessary. Do away with ornate stuff and opt for simple and clean lines. Simple décor and clean lines will give the small bathroom a clean look and create an illusion of space. Do away with the bulky bathtub and install a sleek looking all glass shower cubicle. The all glass cubicle will give a transparent look and also create enough space for you to move around in. Do away with accents or dark shades in the bathroom. They absorb light and make a small bathroom look smaller. Also use lighter tiles and colors that will create a spacious look. Instead of having standalone cabinets, use the walls for having storage set ups with the help of all fixed units. The floor area does not get blocked while the wall is used for necessary storage. If you are not sure of handling the remodeling, it would help to do a sketch of the present area and look at different possibilities. Instead of jumping into it, a little bit of planning goes a long way and helps you to achieve your goals. Should you be still unsure, look for companies who help with remodeling and offer affordable schemes and work around your budget. If you are working on making your kitchen design worthy, you will need to pay attention to the cabinets. Typically the highlight of this space, aside from appliances and paint, there are some things you should know about working with existing cabinetry. Ultimately, you have two options available if you don’t want to buy brand new; refacing and refinishing. Both alternatives are cheaper than a complete overhaul, and each has its own advantages and disadvantages. 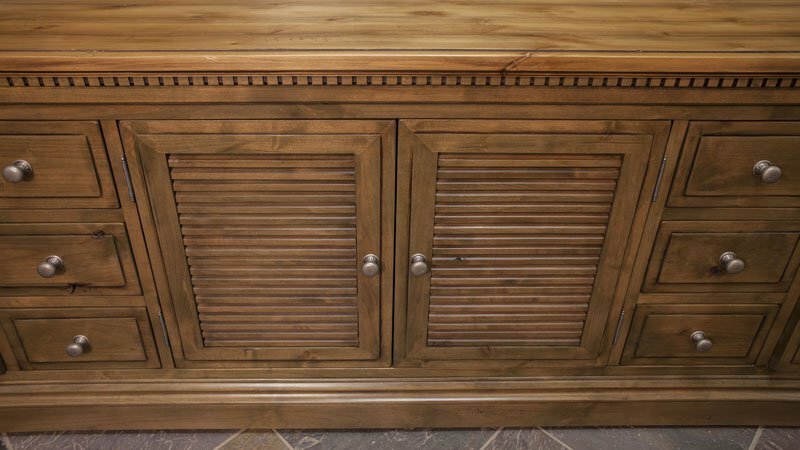 Here are some pros and cons of cabinet refacing and refinishing; make sure to evaluate your needs and budget. Should You Reface of Refinish? 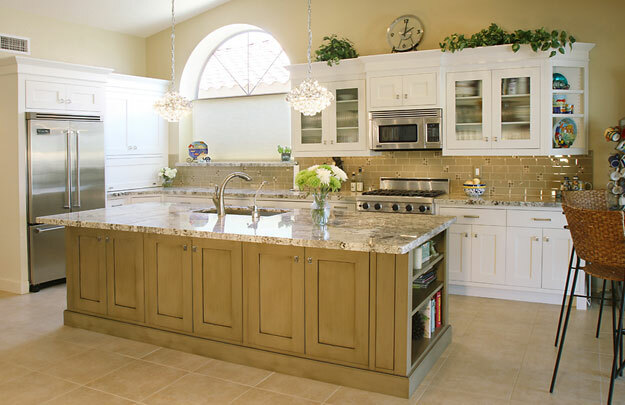 Refacing allows you to keep your existing cabinets, while installing new doors and drawers. A veneer is applied to the cabinets to give them a finish that can match your new pattern (there are many finishes to choose from). Refacing is ideal for people wanting to maintain the overall layout/function, but also make their old cabinets look like new. Refinishing is the cheapest option and is a much quicker job to complete, and it entails applying new paint or stain. A downside to refinishing is that your cabinets must be in good condition for it to work. People that have damaged units would be better suited for a refacing or replacement job. Bear in mind that you will only be able to apply a darker color to your cabinets when refinishing them. Refacing offers a number of benefits of refinishing. 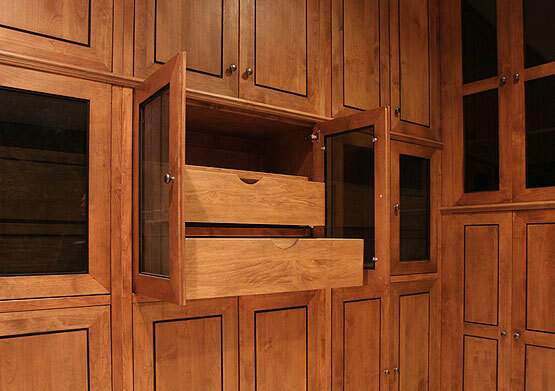 For starters, you have the ability to choose all new doors and drawers for your cabinets. If you are updating your kitchen, this is a great way to match the overall style and design. Likewise, the cabinets themselves can be made to fit the look, as you can choose from a variety of veneers. If you love your existing layout, this is a solid choice. If you are working with a limited budget, refinishing may be the better option. You don’t need to hassle with buying anything new, as this job will only require your existing cabinets (doors and all) to be stripped and re-painted or stained. For this to work properly, the cabinets must be in good condition. Also, make sure you are satisfied with the color palette in the kitchen, as you won’t be able to apply a lighter color to the cabinetry. With the economy still lagging and the holiday season approaching quickly, people are doing whatever they can to save money. 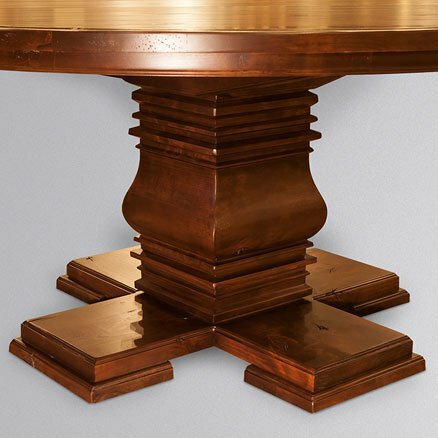 If you are in the market for some new furniture, you may want to consider buying a discounted vs. new product. There are some distinct advantages to not purchasing brand new pieces, but there are also some downsides. Weigh the options and choose what will work best for you. Oftentimes, this does not mean spending a fortune a good piece of furniture. Should You Buy Discounted Furniture? When it comes to buying pieces for your house, it pays to know how to save money. It is not uncommon for a brand new living room set to be priced high. In this economy, one would be hard pressed to find someone willing and able to fork over this kind of cash. You always can always take the payment plan route. For the most part, discount furniture tends to be much cheaper. You can get a nice set for a fraction of the cost, and you don’t need to hassle with financing. You will own the product free and clear. Many people are under the impression that prices equates to quality. This is not always so; most of the time discounted furniture is old inventory that a store is trying to get rid of. With this, you get the best of both worlds (new pieces at a great price). Don’t automatically assume that just because you are buying the newest item that you will be giving up value. 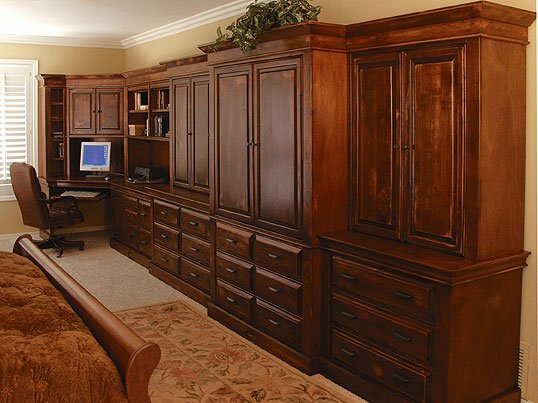 At Stone Creek, we offer great quality pieces at very affordable prices to our customers. We know how taxing the economy is on everyone, so we strive to keep our prices low without while still creating quality products. It is with every little effort that you can make the world a better place to live in. Small or big, efforts are made to make the environment safer, healthier and happier. You can do so by opting for the green revolution and in your own little way, supporting it. As home owners you can significantly opt for the green approach by making little changes to your lifestyle. In addition, little remodeling in and around your home will make it a sustainable effort and also help you save in the long run. Your home may not have been built to sustain the new approach of ‘go green’. With that said you can remodel and make some changes which will ensure and lead your steps to contributing to the environment around you and make it a better place for you to live in. 1. Should you need to remodel your home, convince yourself to use health department certified non-toxic paints, finishes and polishers for your home. They are eco-friendly and keep your home free from any kind of toxic fumes. 2. If you have plans of changing your flooring, opt for natural materials like natural wood or bamboo flooring. Do away with the synthetic vinyl or the synthetic carpet flooring. Wood and bamboo are naturally accepted materials and can be used as and how you would want to. 3. Change the present electronic devices and appliances with ones that have the energy star rating on them. This will substantially reduce your utility bills and also give you an added advantage of using state-of-the-art equipment. 4. Spend a little extra and make sure that your doors and windows are well insulated therefore making your home energy efficient. 5. Use furniture made with natural and recycled material. This gives your home an airy feel and also adds to the style and esthetics. 6. If you prefer to customize your furniture, look for companies that work with natural materials and also believe in the green concept. They will help you make the right choices and also work with materials that are obtained locally and therefore help in reducing costs. Remember that going green is not only about saving money, but also a promise to contribute to the welfare of the environment at large. If you are looking at designing your kitchen and not sure how to go about it, here are some tips that will help you in deciding. There are various options to choose from, but most of it would depend on the base design of your kitchen and the available infrastructure. Tip 1: If you are looking at re-doing your kitchen and have a wish list, it may help to jot down your wants. Instead of going head on with the renovations, it may help to understand that some ideas can or cannot be incorporated. Tip 2: How is the layout of your kitchen – traditional or contemporary? With that said, are you looking at the traditional black or white appliances, or the sleek steel ones sporting the contemporary look. Tip 3: One of the most essential part of your kitchen is cabinets installed in the kitchen. Cabinets placed strategically helps to organizing the kitchen. Work and storing gets easier. Start from one corner and go around the kitchen. Decide on ‘lazy susans’, ‘magic corners’, ‘pull outs’ and other facilities that can be inserted into the cabinets. Tip 4: More than the aesthetics make sure that the kitchen design is more ergonomic than just for show. Use large cabinets that hold smaller ones inside. It will help to cover up as much as is needed, yet provide a stately look to the set up. Tip 5: Keep the range closer to the sink as it will help to put away the dirty utensils for wash immediately and help avoid accidents. The microwave can be fitted on the wall and therefore help to save space. If you have space, an extra oven always helps, especially when you have guests. 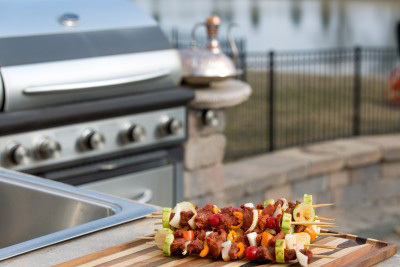 Tip 6: Keep enough space for countertop use and preparation for the cooking. Space also helps to place hot utensils and avoid banging into them. Tip 7: Most importantly remember a design that holds good for someone else’s kitchen may not sit well in yours. So be aware of what you have and think of incorporating ideas accordingly. Make the most of the existing ones before adding newer features. If you are not sure of yourself, you may get in touch with Stone Creek Furniture and we can help you re-design your kitchen, keeping what you have in mind. For inspiration, view our kitchen gallery.